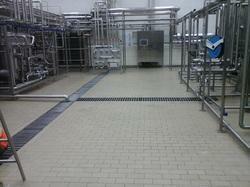 We are instrumental in offering a wide and commendable array ofIndustrial Tiles to the clients. These products are ideal for providing smooth and attractive floors in industrial areas. Further, the offered range is produced through full body, which are also available in various sizes and standards specified by the company. Patrons can avail this range according to their requirements. Size: 300 x 300 mm, 30 x 30 cm, 12" x 12"
Vikas Sanitary Wares, with its establishment in the year 1992, is known to be one of the leading manufacturers, suppliers, exporters and traders of this impeccable range of Natural Stones & Tiles. Making of this range is done following the norms and guidelines defined by the industry and using the finest raw materials and advanced machines. This ensures the product’s finishing, sturdiness and attractive design. This range is inclusive of the finest and highly acclaimed and asked for products like, Plain Color Floor Tiles, Anti Skid Series Floor Tiles, Heavy duty floor tiles and Leather Floor Tiles. In addition, the offered range is marked at a market leading rate. Our highly advanced state-of-the-art infrastructure, laced with all the necessary machinery and equipment, facilitates the attainment of a number of the firm’s goals and objectives. For reasons of extending our reach in the market, we upgrade our facility on a highly regular basis. To attain smoother and finer management of the firm’s operations, the facility has been parted into a number of units. These units, highly operational in nature, work in the most united manner, with high level of dedication, to maximize the firm’s production capacity. Further, our abidance of industry ethics, have helped us generate a huge and highly reputed client base. We are exporting our products all over the world.